Hello Tampa Bay, It’s Jodi with information on a fun way to give back and work on your golf game. 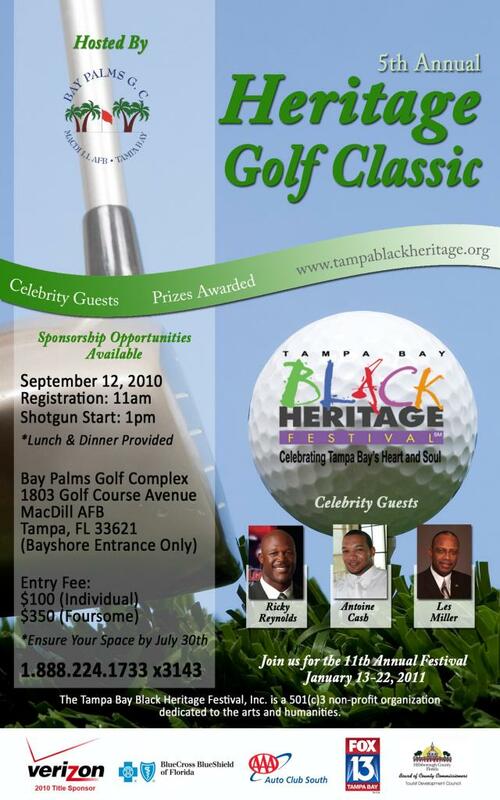 Join former state senator Les Miller and former Tampa Bay Buccaneers players Antoine Cash and Ricky Reynolds for the Tampa Bay Black Heritage Festival’s 5th Annual Heritage Golf Classic. On Sunday, September 12th, make sure you head to the Bay Palms Golf Complex at MacDill Air Force Base for a fun day of golfing for a cause. The Heritage Golf Classic will benefit the Black Heritage Festival’s Student Scholarship Fund, providing for the Festival’s core initiatives of education, art, and cultural enrichment. Usually part of the 10-day festival in January, the heritage Golf Classic is becoming a fall fundraiser to help maintain the Festival’s positive impact on the community year-round. Registration will begin at 11am with a shotgun start at 1pm, an individual can play for $100 with foursomes registering for $350. If golf is not your sport but you would still like to support the Student Scholarship Fund and take part in a fun day, you can register to participate in the lunch or dinner for $20. For registration and sponsorship opportunities, email Demetrick Anglin at golf@tampablackheritage.org, call 1.888.224.1733 x3143 or visit www.tampablackheritage.org. The Bay Palms Golf Complex is located at 1803 Golf Course Avenue on MacDill Air Force Base, please enter through the Bayshore entrance. That&apos;s all for now, but be sure to stay tuned in for more Golf Tampa Bay updates from me and the rest of the Tampa Bay team!